The Facebook Algorithm is one that has us all scratching our heads. It’s constantly changing and it feels we can never quite keep up with it. But one thing I can tell you for sure: if there is one thing you can do to beat the Facebook Algorithm it is to use Facebook Live. I know, but what will you say? What will you do? Will anybody watch? And then there’s the fact that you’re camera shy. I get it. I’m right there with ya. 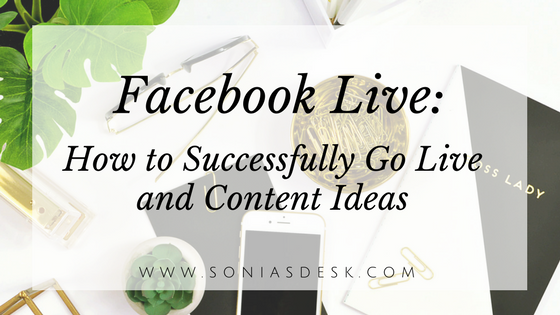 In this blog post, I discuss some key points to keep in mind before you hit LIVE, ideas on what content you can talk about, and some planning tips. You can learn more about the current state of video marketing in this blog post. 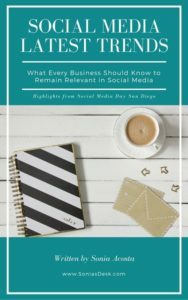 As I shared in this blog post where I discussed the Facebook Algorithm, I recently attended a conference with all the big leaguers in the world of social media, and here’s what they had to say about Facebook Live. Do a Facebook Live of at least one minute. If you’re too shy or scared to be on camera, like me, do just one minute, nothing less. This ensures you will at least be able to gather insights on the video.Facebook wants LIVE consumption. Facebook Live videos live on your feed forever. So even if nobody is watching you live, when they go to your page, or log on to Facebook, they will be able to view it. Facebook wants LIVE consumption. That’s why you get notifications when someone is live. So the longer your video is, the more chances you have of getting people to watch you live and interact. It’s a good idea to do your Facebook Live postings regularly, like a show. Then people know to expect you and log on to watch you. Let your audience know when you will do a Facebook Live with a status post. Give them the date and time with a brief description of what you will be discussing, so again, there’s a better chance of them joining you. Don’t introduce yourself, just go for it. People will decide within the first 2 to 3 seconds if they will continue watching. So, tell them first what you’re going to cover in your video, then go. Hair and makeup do not have to look good. You just need to build a relationship and set yourself up as the expert. Average video view time on Facebook is 6 seconds. Not worth boosting. If your video has an average view time of 10 to 15 seconds, this is a unicorn. Spend money on it… boost it! Most people watch video on mute. Use captions. “Facebook will reward longer videos if people are watching. Longer videos that are seen to the end will be given preference”. Go live 2-3 times per week, every week. This is ideal. But if you’re like me and you’re just starting off, once a week will do. I know you’re now asking, “So what do I talk about in this FB Live video?” Glad you asked. Make sure you tell a great story. Be truthful, emotional, attentive, real and simple. Storyboard Your Ideas with a Content or Editorial Calendar. Give CTAs and respond to all comments and engagement. I’ve done a few FB Live videos myself and yes, it’s nerve-wracking, and I’m sooooo self-conscious. But it really does kick engagement up. I also manage several social media accounts for my clients. I ALWAYS recommend they do Facebook Live. And when they do, we definitely the highest views and engagements. Have you started using Facebook Live yet? If yes, what has your experience been? If no, why not? Shoot me an email at sonia@soniasdesk.com, leave a comment on Facebook or leave a comment here. To read all the highlights I took away from Social Media Day Conference including the latest information on Facebook Ads, User Generated Content, Facebook Live, Instagram Stories, Content Creation and more, you can download it here.